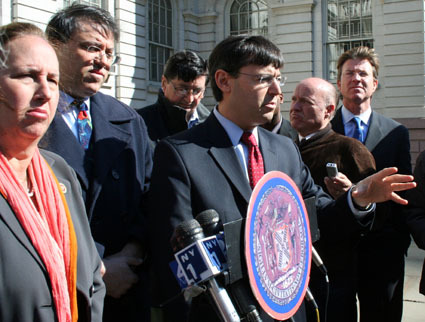 Council members David Yassky, Gale Brewer and Alan Gerson want to give the council some options, they said at a joint press conference on the City Hall steps this afternoon. To do that, they will introduce an amendment on the floor of the chamber tomorrow during the council’s stated meeting requiring a City Charter review commission and referendum on term limits before an extension could take effect. Each said they were still undecided — despite the grilling from the City Hall press corps — and would not divulge how they would vote if their amendment was defeated. Yassky pledged to not abstain, while Gerson said it was an option. Essentially, their amendment takes the James-de Blasio bill (which requires the city set up a review commission to look into term limits then send it to the voters) and incorporates it into the mayor’s bill (which simply extends the city’s term limits from two to three terms). Neither the de Blasio-James or the Weprin bill (a full explanation of all the term limit legislation is available here) were put on the agenda for tomorrow’s meeting. Yassky said it was obvious the speaker wanted to do it legislatively. Interestingly, what this amendment will do is force council members who support the mayor’s bill to vote against a referendum and charter review commission before they can vote on the mayor’s proposal. (I imagine that could come back to haunt them.) Any member, as we explained here, can propose an amendment during a stated meeting. Weprin’s Communications Director Pat Barrientos said he had no explanation as to why the other bills were not on the agenda tomorrow, while the mayor’s bill was. The three will be lobbying over the next 24 hours to try to get that support, they said. Beyond that, who knows if the mayor would sign such a bill. Mayor Michael Bloomberg has been arguing there is no time for a special election before next fall’s citywide contest. So, if this amended bill were to pass, would he veto it on principle? Gerson, Yassky and Brewer have been three of the undecideds targeted by groups who oppose the extension of term limits legislatively. I think the Brewer, Gerson, Yassky proposal is a good idea for people like me who dislike term limits but hate the dishonest end-run Ms.
Quinn and Mr. Bloomberg have tried to force on us. With their three votes and the 23 opposed to the Mayor’s plan, a council majority of 26 could force a referendum. Which Council member will go on record opposing the chance for people to vote on this issue? If they have already decided to extend the term limits, then what will a referendum do except political cover? They already understand that a clear majority of new yorkers have and do approve of extending, if not abolishing, term limits, so why not take a stand and vote on it now? I just don’t believe that a referendum will add much more to the debate that the public debate going on already hasn’t. i think people will consider his activities for the coming council election on Sept 15th. ALAN J GERSON – the best choice for solving the prevailing issues like overcrowded schools, massive budget cuts, high unemployment rates, and unprecedented cuts to our social services. So on September 15th when you march to polling station please vote for the humble Alan J Gerson to continue his reform works for a cleaner, greener, safer New York City. but gerson have to keep his word to public ftr election.